This article provides a technical discussion exploring the topic of Gradient Based Edge Detection and related aspects. Several filtering options are illustrated and explained ranging from pure black and white edge detection to image sharpening. All of the concepts implemented in this article can be replicated and tested by making use of the sample application included in the associated sample source code. 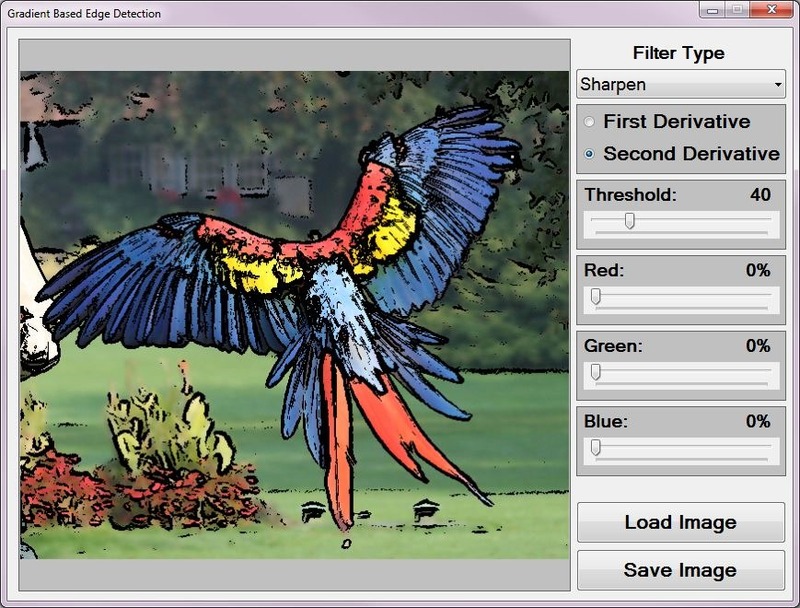 The sample application user interface provides several configurable options to be implemented when performing Gradient Based Edge Detection. The available configuration categories are: Filter Type, Derivative Level, Threshold and Colour Factor Filters. None – When selecting this option no filtering will be applied. Source/input images are displayed reflecting no change. Edge Detect Mono – This option represents basic Gradient Based Edge Detection. Resulting images are only expressed in terms of black and white pixels. Edge Detect Gradient – Gradient Based Edge Detection revolves around calculating pixel colour gradients. This option signifies a scenario where the pixels forming resulting images express the relevant pixel’s colour gradient, when a pixel has been determined to reflect part of an edge. If a pixel is not considered to be part of an edge, the relevant pixel’s colour value will be set to black. Sharpen – In terms of edge detection, image sharpening can be achieved by emphasising detected edges in source/input images. 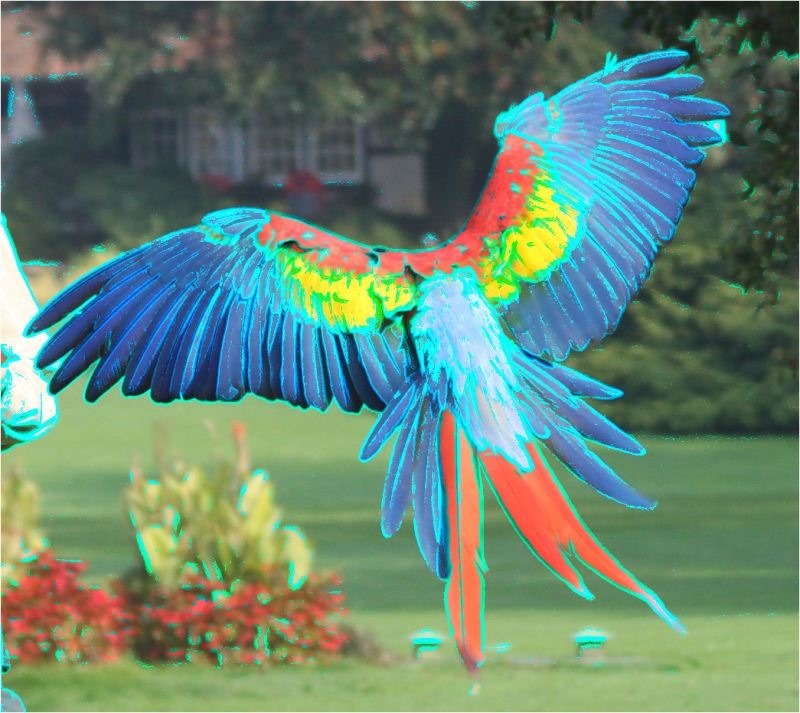 Emphasising edges involves combining a source/input image and an image which express only detected edges. Sharpen Gradient – This option combines calculated colour gradients and the original colour value of a pixel on a per pixel basis when a pixel has been determined to be part of an edge. If a pixel does not form part of an edge, the pixel’s colour value is set to that of the original pixel colour. The user interface defines two RadioButtons: First Derivative and Second Derivative. These user interface options relate to the edge detection method being implemented, either First Order or Second Order derivative operators. Comparing a global threshold and colour gradients on a per pixel scenario forms the basis of Gradient Based Edge Detection. The TrackBar labelled Threshold enables the user to adjust the global threshold value implemented in pixel colour gradient comparisons. Filter Type – Edge Detect Mono: Not applicable. Edge Detect Mono filtering discards all pixel colour data. Filter Type – Edge Detect Gradient: If a pixel is detected as part of an edge, the pixel’s colour values will be set to the gradient calculated when evaluating edge criteria. Gradient values are multiplied by Colour Factor values before being assigned to a resulting image pixel. Filter Type – Sharpen: The pixels which form part of an edge, in terms of the resulting image the corresponding pixels will be set to the same colour values. In addition pixel colour values in the resulting image are multiplied by with the relevant Colour Factor. The image pixels not detected as part of an edge will not be multiplied with any Colour Factor values. Filter Type – Sharpen Gradient: Edge detected pixels in a source/input image will have the effect of corresponding pixels in the resulting image being assigned to the calculated colour gradient value, multiplied with the relevant Colour Factor value. In the scenario of a pixel not being detected as forming part of an edge, Colour Factors will not be implemented. Threshold: The global threshold value specified by the user determines the level of sensitivity to which edges will be detected. The degree to which edges are detected through the threshold value impacts upon whether a pixel will be multiplied with the relevant Colour Factor value. The values expressed by neighbouring pixels. The more intense or sudden differences that occur between neighbouring pixels will result in higher accuracy edge detection. A user specified global threshold value used in comparison operations acts as a cut-off value, ultimately being the final factor to determine if a pixel should be expressed as part of an edge. Calculate and combine horizontal and vertical gradients for each of the colour components Red, Green and Blue. If the sum total of each colour component’s calculated gradient exceeds the global threshold value consider the pixel being iterated as part of an edge. If the sum total of colour gradients equate to less than the global threshold implement step 3. Calculate a pixel’s horizontal gradient per colour component. When comparing the gradient sum total against the global threshold consider the pixel being iterated part of an edge if the sum total of gradient values exceed that of the threshold. If the total of colour gradient value do not exceed the threshold value continue to step 4. Calculate a pixel’s vertical gradient per colour component. When comparing the gradient sum total against the global threshold consider the pixel being iterated part of an edge if the sum total of gradient values exceed that of the threshold. If the sum total of colour gradients do not exceed the threshold value continue to step 5. Calculate and combine diagonal gradients for each of the colour components Red, Green and Blue. If the sum total of each colour component’s calculated gradient exceeds the global threshold value consider the pixel being iterated as being part of an edge. If the sum total of colour gradients equate to less than the global threshold the pixel being iterated should not be considered as part of an edge. Edge Detect Mono – All pixels will be set to white. Edge Detect Gradient – Each colour component will be assigned to the related colour gradient calculated when performing edge detection. Each Colour gradient will be multiplied with the related colour factor. Sharpen – The value of a resulting pixel will be calculated as the product of the corresponding source pixel and the related colour factor value. Sharpen Gradient – Results are calculated in terms of the sum total of the corresponding input pixel and the product of the related colour gradient and colour factor value. 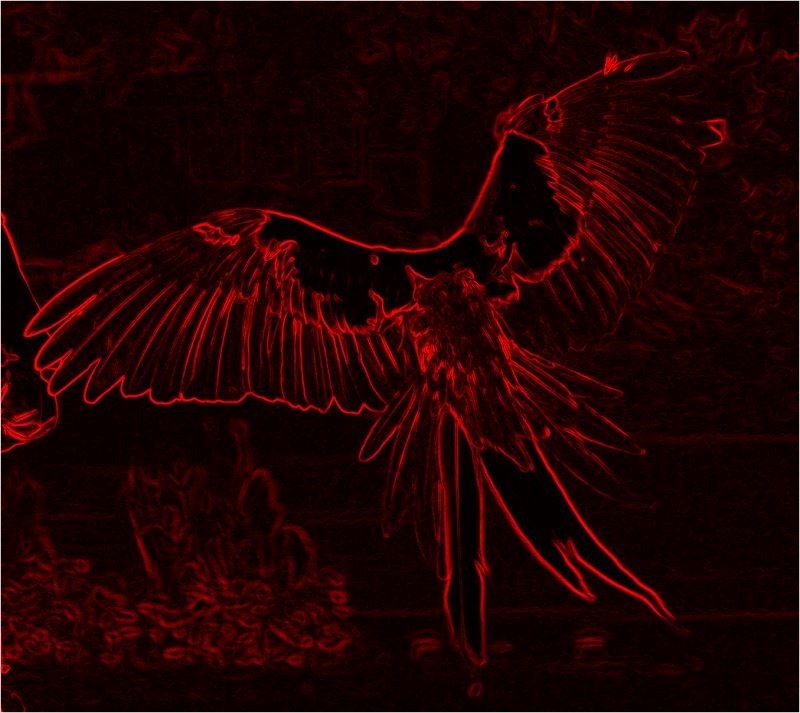 The sample source code associated with this article provides the defines of the GradientBasedEdgeDetectionFilter extension method targeting the Bitmap class. This method iterates every pixel contained in the source/input image. Whilst iterating pixels the method creates a 3×3 window/kernel covering the neighbouring pixels surrounding the pixel currently being iterated. Colour gradients are calculated from every pixel’s neighbouring pixels. The banner images depicting a butterfly featured throughout this article were generated using the sample application. The original image has been licenced under the Creative Commons Attribution-Share Alike 3.0 Unported, 2.5 Generic, 2.0 Generic and 1.0 Generic license. The original image is attributed to Kenneth Dwain Harrelson and can be downloaded from Wikipedia. The sample image featuring a Scarlet Macaw has been licensed under the Creative Commons Attribution-Share Alike 3.0 Germany license. The original image can be downloaded from Wikipedia.